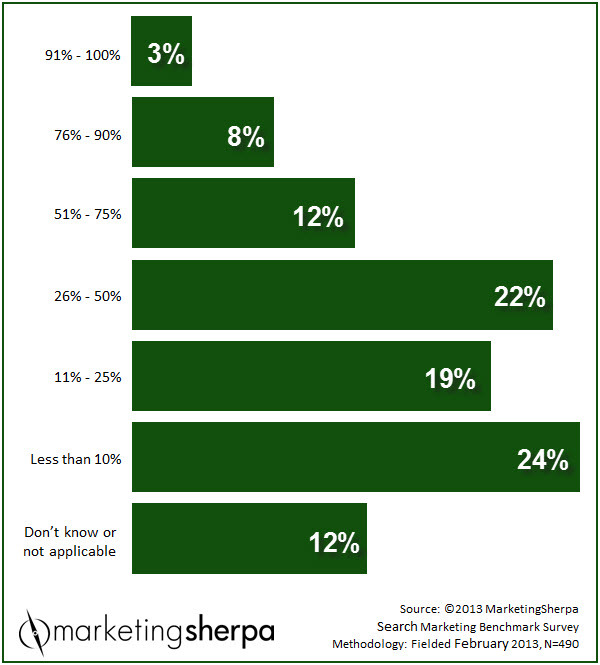 Marketing Research Chart: How dependent are your fellow marketers on organic search? How dependent is your company on organic search traffic? In other words, what percentage of your organization’s total lead volume is generated from organic search? That's the question we asked in the MarketingSherpa SEO Marketing Benchmark Survey. Read the latest MarketingSherpa Chart of the Week to see how your peers responded and explore with us the potential and pitfalls of a business heavily reliant on organic search traffic. I've heard it described this way by a frustrated marketer. "A search engine algorithm change would be like a city tearing up Main Street and moving it a few blocks overnight, and the next morning all of the stores that were on Main Street are now on Third Street." Organic search traffic is very enticing with its steady stream of free highly motivated traffic to your website. However, it puts your business at the mercy of search engine companies. Given the huge rewards and the possible risk, how much do marketers rely on search engines? Let's take a look at the data. Q: What percent of your organization's total lead volume is generated from organic search? The quote in the summary section of this article is from the MarketingSherpa SEO Marketing Benchmark Survey. However, after taking a look at the data, it appears most marketers do not agree with this marketing manager’s reliance on organic search traffic. Only 3% of marketers said organic traffic accounts for 91% or more of their lead volume, and just 11% of marketers responded organic search accounts for more than 76%. Most marketers see natural search traffic as the source for less than half of their leads, with 24% of marketers saying natural search is the source of just a small sliver — less than 10% — of their overall lead volume. As we look at the breakout data, marketers who identified themselves as both B2C and B2B were most likely to focus on organic traffic, with 5% of these marketers saying it comprised more than 91% or more of lead volume. Of B2C marketers, 23% said organic search generated less than 10% of leads. For B2B and/or B2G marketers, 27% responded similarly. What's the biggest takeaway from this data? While some marketers are very tantalized by the possibilities of organic traffic, like the digital marketer who replied, "SEO is paramount at this company. Top three rankings dominate 80% of clickthrough, so achieving high organic rankings is extremely valuable to us." However, for the majority of marketers, organic search is just a part, and sometimes a very small part, of their business. I'll leave the last (key)word on the subject to this director of marketing, "The key remains acquiring high-quality inbound links, which is extraordinarily tough — and always has been. Due to poor conversion to lead from organic traffic so far, hard to justify resources."